Meet builder, Tom Fellenbaum. 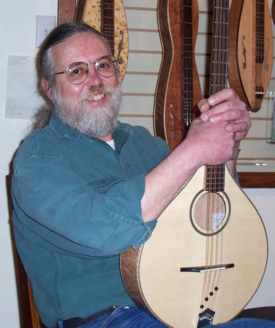 He began building instruments in 1974 while a student at Warren Wilson College in Swannanoa, NC. Tom was born in southeastern Pennsylvania and raised in Lancaster Co., PA. He arrived at Warren Wilson College in western North Carolina during the late summer of 1971, anxious to further his education. While pursuing a degree in economics, Tom became interested in the traditional music of the southern Appalachian Mountains. In 1974 David Holt came to WWC and started the Appalachian Studies Program. With all of his economics requirements met, Tom finished his time at Warren Wilson in the Appalachian Studies Program. He learned to play the mountain dulcimer as well as clawhammer banjo, field collected traditional music and did independent studies in log cabin building and dulcimer building. While he graduated in 1975 with a degree in economics, the Appalachian Studies Program had changed his life forever! Tom has been a member of the Southern Highland Craft Guild since 1979, the same year that he opened his first shop in Black Mountain, just a few miles down the road from Warren Wilson. At that time his business was known as Fellenbaum Dulcimer Workshop. He recorded two albums, The Strayaway Child and Heartdance with musical partner Jerry Read Smith in 1981 and 1986 respectively. Since 1998 he has co-hosted a Celtic music show, on Public Radio Station WNCW, called “Celtic Winds,” which airs Sundays from 12 noon-3pm eastern time. You can listen live at www.wncw.org. Tom’s co-host is Richard Beard and they alternate Sundays on the air. Tom and his sweet lovely bride, Stephanie Wilds, proudly operated one of Western North Carolina’s premier acoustic music stores, Acoustic Corner in Black Mountain, from July 2000-April 2016. In 2016 Tom built a new shop for his instrument building at his home in Old Fort where wife Stephanie also maintains her quilting studio (www.wildsfabrications.com).